There are a lot of "issues" to think about as the year ends. New beginnings as we see students transition from one grade grouping to another is a big issue. Graduates and their future plans is another. Perhaps your energy is on saying thank you and good bye to those who are retiring or moving to other positions in other locations. But what about looking around and seeing what talent is just waiting to be encouraged to move into special education administration? The third goal in the CASE strategic plan states: "CASE will be active in the development and mentorship of special education administrators." One way CASE can be active is in reminding our members to always be looking for the next generation of leaders. It may not be your typical end of the year thought, but as your year is winding down, take a moment to think about those teachers, support staff, and related service providers who have shown that spark and perhaps need to be encouraged to take that first step on to the special education career ladder! Speaking of encouragement... Time is running out to nominate a "new to the field" special education administrator for the "G" award. What an encouragement for that new special education administrator in their first three years of administration work to be nominated and perhaps win this great award! The deadline is this week so see the article below and nominate one of your new to the field administrators! I am encouraged that so many folks had already registered for the CEC/CASE Legislative Summit this July. But we still do not have every state represented! We need to "tell the story" of all the amazing things our staff and students have accomplished this year to those up on the Hill. As the tag line says, "What happens in the classroom shouldn’t stay in the classroom. Send the good news from your district to Capitol Hill." We need a team from EVERY state in order to really make a statement! As you enter into your Senator or Representative's office, think what kind of impression you will make when you can say there are teams visiting their Senator's and Representative’s offices from all 50 states! Be a leader and not only make sure you are a part of this great event, but make sure you are a part of a TEAM to make an even bigger impact on your state delegation! Go to the CASE website or straight to the Summit website for more information and to register now! Last Week's Poll asked "Which do you think is the one essential element that clearly distinguishes a good special education program from a great one?" Clearly there is no one essential element but it is good to see the ideas of which one should carry more weight. 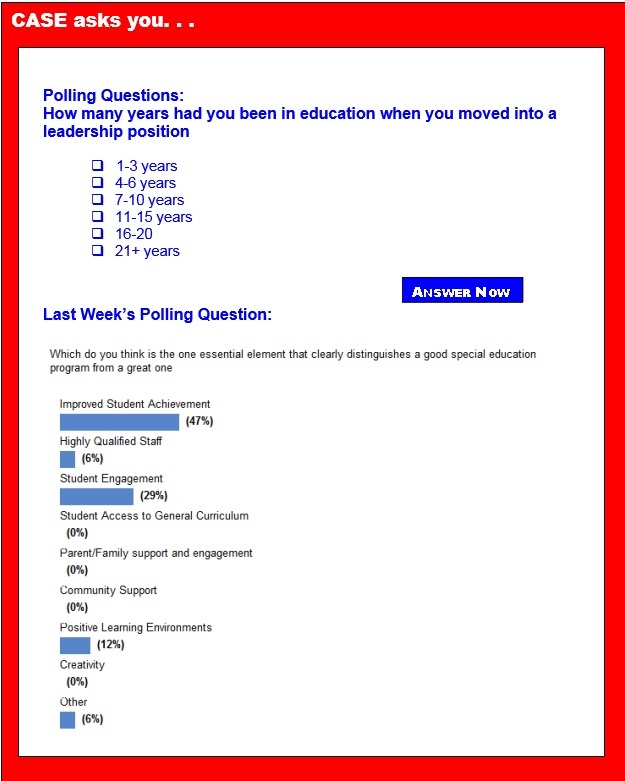 Of those answering the poll, first place at 47 percent went to improved student achievement. Coming in at second place was student engagement at 29 percent. Next at 12 percent was positive learning environments. There was a tie for last place at 6 percent between highly qualified staff and "other." As I mentioned last week, I am a very small part of a great group of cross stakeholders working on developing a rubric for a Quality Special Education program. The work is being led by the Center on School Turnaround and is following the Leading by Convening process developed by the IDEA Partnership! Watch for more details as the work moves forward! Thanks for all you do all the time to make sure ALL students succeed! Do you know a new special education administrator who has routinely "stuck their neck out" for teachers and students during this past school year? Last year was the first year for the new CASE award called the "G"AWARD for Rising Special Education Administrators. It was instituted for a member of CASE who is early in his/her career as an administrator. This individual may be nominated within their first 3 years of administrating special education programs/services and the award will be accompanied by a night on the town in their home area (limo, dinner, movie, child care, etc.) with a $1000 value. This award is acknowledgement of the administrator for sticking his/her neck out to better support their teachers to enable them to make a difference in the lives of the students they serve. The deadline for the award nomination is June 15. Nominations should be sent to Membership Chair Emilie Maule. You can go to the CASE website to get additional information or you can click here. Whitepaper | 5 Legal Dos and Don’ts for Staying Out of Due Process in Special Education by Julie Weatherly, Esq. Videos | Does online therapy work for speech, OT, behavioral and mental health services? See it in action. This year, CASE will be joining forces with CEC to make an even bigger impression up on the Hill! This four-day legislative summit is for teachers, administrators, teacher educators, teachers in training – anyone who passionately supports national special education issues that improve educational outcomes for students with exceptionalities and the professionals who work on their behalf. Special Education Day on Capitol Hill will show decision makers in Washington how investing in special education pays off in successful students who are college and career ready and make important contributions to their communities. The updated 2015 edition of How Safe Is the Schoolhouse? An Analysis of State Seclusion and Restraint Laws and Policies, written by Jessica Butler, has been published by the Autism National Committee. The report describes and examines state restraint and seclusion statutes, regulations, rules, and policies/guidelines in effect as of March 2015. Free Webinar | Data & Privacy: Do we know how to protect our students? Lehigh University’s intensive one-week institute provides a practical analysis of legislation, regulations, and case law relating to the education of students with disabilities. The symposium is designed for special education coordinators and teachers, principals, psychologists, parent advocates, attorneys (on both sides), hearing officers, state officials, and other individuals interested in legal literacy concerning the education of students with disabilities. The program offers two parallel tracks, one for basic that offers in-depth foundation knowledge about the IDEA and Section 504: Eligibility, FAPE, LRE, Student Discipline, and Remedies. The other track is for advanced participants, offering brand new "hot topics": Settlement Process, Exiting Special Education, "Meaningful" Parental Participation, Inadequate IEP Implementation as a FAPE Denial, Transition Services, Parental Private Placements, and State Complaint Resolution Process. The experienced program faculty features attorneys Laura Anthony (Ohio), Edward Bauer (Florida), Maria Blaeuer (Washington, DC), Esther Canty-Barnes (New Jersey), Andrew Cuddy (New York), Laura Gillis (Massachusetts), Zvi Greisman (Maryland), Dana Jonson (Connecticut), Michael Joyce (Massachusetts), Isabel Machado (New Jersey), Deborah Mattison (Alabama), Kevin McDowell (Indiana), Michael Stafford (Delaware), and — from Pennsylvania — Andrew Faust, Joshua Kershenbaum, Dennis McAndrews, Gabrielle Sereni, and Dr. Perry Zirkel. The symposium begins on Sunday evening with a dinner and keynote lecture by Dr. Melody Musgrove, Director, Office of Special Education Programs (OSEP), U.S. Department of Education. The workshop is offered for graduate and continuing education credit. Weekly and daily options are available. Full information is available on our website: coe.lehigh.edu/law. For any questions, email or call Shannon Weber or Donna Johnson at specialedlaw@lehigh.edu or (610) 758-5557. Earlier today the U.S. Department of Education released a new report outlining the unmet need for high-quality early learning programs in America. Roughly 6 in 10 4-year-olds are not enrolled in publicly funded preschool programs, and even fewer are enrolled in the highest quality programs. Has the frenzy around Common Core State Standards impacted decisions on which state summative assessments are being administered this year? That's the question on many minds as we approach spring testing time. As many states began adopting college and career ready standards, such as the Common Core State Standards, there became a subsequent need to develop new summative assessments — tests that measure the new skills and knowledge outlined in the new standards. The LOGAN® PROXTALKER® communication device is ideal for any picture exchange system user, of any age and is being used for communication or as a classroom tool. Want to enhance your advocacy skills, learn about important special/gifted issues and early intervention, and take CEC's messages to Capitol Hill? Then come to the Special Education Legislative Summit July 12-15 in Alexandria, Virginia. Registration is easy, simply visit the Special Education Legislative Summit website, click the registration tab. Join us in July! The Center for Disease Control released a new study, Treatment of Attention-Deficit/Hyperactivity Disorder among Children with Special Health Care Needs, describing parent-reported treatment of ADHD among children with special health care needs, and how this reported treatment aligns with the current American Academy of Pediatrics guidelines. This is the first nationally-representative U.S. study on ADHD treatment that considers medication, behavioral therapy, and dietary supplements. The OSEP-funded IRIS Center developed a new module that highlights the importance of establishing classroom rules for young children including those with disabilities, and communicating with the family about rules and expected behaviors. The module entitled Early Childhood Behavior Management: Developing and Teaching Rules, features strategies for teaching and reinforcing rules for young children. The content addresses CEC's Division for Early Childhood Recommended Practices, and provides guidelines for effectively developing and displaying rules. In this wide-ranging presentation, CEC's Policy and Advocacy Director, Deborah A. Ziegler, will review and analyze policies currently under discussion, recent changes to policies supported by the Obama administration and the U.S. Congress, and their impact on children and youth with disabilities and/or gifts and talents. Achieving Mobility and Having Fun! Every child deserves the chance for growth. Mobility can be difficult to achieve for children with special needs, even after years of rigorous therapy. While children are simply enjoying a nifty, exciting new toy, parents are amazed at the continuous improvement of motor skills, coordination, balance and more. Voyager Passport® gives you a dynamic blend of print instruction and technology to help more of your struggling learners master priority skills and strategies to reach grade-level performance. A Teacher's Resource Kit includes everything you need to accommodate diverse learners, including instructional support for English learners and flexible grouping strategies. Students with disabilities continue to score much lower than their peers on state tests, even as graduation rates for students with disabilities inch upwards, according to a new report. In 2012-2013, students with disabilities scored from 32 to 41 percentage points lower than their peers on state tests, according to the "2012-2013 Publicly Reported Assessment Results for Students with Disabilities and ELLs with Disabilities," released in May. The gap was lowest in elementary math, and highest for middle school reading. The report is the 16th survey of states conducted by the National Center for Educational Outcomes at the University of Minnesota. Advocates are accusing schools across one of the nation’s largest states of using truancy laws to funnel kids with disabilities off their rolls. Thirteen school districts in Texas — including those in Austin, Houston, Fort Worth and San Antonio — are allegedly using truancy laws to absolve themselves of responsibilities under the Individuals with Disabilities Education Act, according to a complaint filed this week by the advocacy groups Disability Rights Texas, the National Center for Youth Law and Texas Appleseed. Discipline problems and behavior issues have always been and continue to be a leading frustration for teachers. The good news is that variables can easily be manipulated to have a positive influence on student behavior. By being proactive and purposeful in our planning, we can prevent behavior problems before they arise. By building positive relationships with students and explicitly teaching classroom routines, we can manage behavior and increase student motivation. The U.S. public school system's focus on struggling students leaves high-achievers — especially minorities, the economically disadvantaged and English language learners — without a challenging enough education, experts say. A lack of federal funding and patchwork policies across states often leave decisions on identifying and serving gifted students to district administrators. An estimated 3 million to 5 million academically gifted students attend K-12 schools, and it is unknown how many are receiving services, according to the National Association for Gifted Children. Children who stutter may have difficulty perceiving musical rhythms, a small study suggests. Researchers say the findings could offer some clues to the origins of the speech problem — and even hint at potential therapies. The study, reported online recently in the journal Brain & Language, involved 17 children with stuttering and 17 without. The investigators found that kids with the speech disorder tended to have trouble distinguishing drumbeat patterns during a computer game. One of my favorite stories about one of my young clients is this: His fourth-grade teacher assigned the students to do a social studies report on the Transcontinental Railroad as part of their study of Western expansion. His mother took him to the library to get the appropriate books. When they got home, she set him up on the kitchen table with the relevant volume of the encyclopedia, the library books, and the art supplies he would need to do a report. Then she went about the business of making dinner. A half an hour later, she went back to check on his progress. He was writing a report about the Great Wall of China! What? In our time of fast-paced, exam-pressured, high-tech culture, where does learning with nature have a place? When adults are asked to recall a time in their youth when they were happiest, invariably they refer to times spent outdoors and with friends. Our clever screen world keeps us busy and on the go, but does not help us to communicate, feel loved, gain the satisfaction of the quiet mind, and relax. Time with others in nature does exactly that — and much, much more! Kindergarten is a wake-up moment for many kids with ADHD. Suddenly, they run into demands to "sit still and listen." Many encounter rules for the first time. Not only do they need to learn the rules, they also need to make new friends, learn new skills, get along with students from other backgrounds, and work in large groups. Parents are shocked by that first phone call from school. At home, their child is manageable, but children with ADHD often lag behind their peers by as much as 30 percent in mastering life and social skills. Structure and support will prevent them from stumbling. How do we help our least motivated, most disruptive students? Urban public school teachers, parents and students often tell me if we got rid of disruptive students and made sure everyone did their work, more kids would learn. Is there a way to do that? By the time he entered second grade, Eric had already witnessed graphic violence and watched as his family fell apart. He'd been moved to a new state and a new home, but he wasn't thriving, especially in school. Eric's reading level was measured in single digits — that is, below the 10th percentile for children his age. "He was so preoccupied by the trauma he'd experienced that it was impairing his learning," says Steve Lepinski, who followed Eric's progress. Researchers found that beginning readers who focus on letter-sound relationships, or phonics, increase activity in the area of their brains best wired for reading. The following Notice of Applications for New Awards; Vocational Rehabilitation Services Projects for American Indians With Disabilities were published in the Federal Register on Tuesday, April 7. Notice inviting applications for new awards for fiscal year (FY) 2015. Catalog of Federal Domestic Assistance (CFDA) Number: 84.250K. Agencies: Office of Career, Technical, and Adult Education, Rehabilitation Services Administration, Education; Employment and Training Administration (ETA), Labor. The following Notice of Proposed Rulemaking regarding State Vocational Rehabilitation Services Program; State Supported Employment Services Program; Limitations on Use of Subminimum Wage was published in the Federal Register on Thursday, April 16. The following Notice of Proposed Rulemaking regarding Workforce Innovation and Opportunity Act, Miscellaneous Program Changes was published in the Federal Register on Thursday, April 16.